One day I took a walk. On that walk I saw a bush I’d seen before, only this time it had so many scarlet berries on it the plant looked like an overzealous father had decorated it for his neighborhood Christmas contest. I stopped and stared. The berries were so luminous the almost glowed from within. 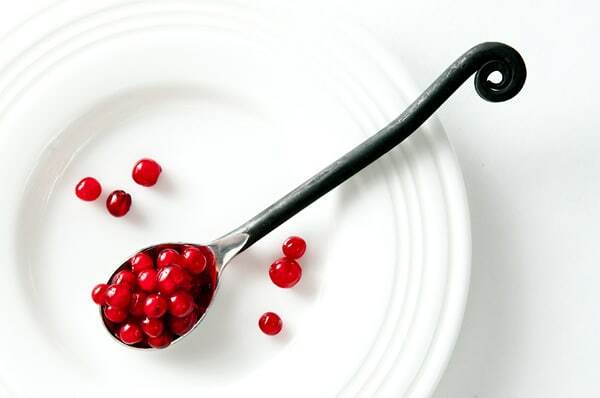 But they were red, and red berries have a bad habit of being toxic in North America. I left them alone and walked on. Something in the back of my head started itching. I have an unusually good memory for patterns and photographs, which serves me well as a forager. And I knew, just knew, that I had seen this plant in one of my edible plant books. But I couldn’t place it mentally. I walked back to the bush and looked at it again, this time with an eye toward remembering its tiny details. When I got home I opened up my books. Huh. Nothing. Maybe the internet could help. But how to find it? Well, the bush had red berries and little leaves that looked like holly. 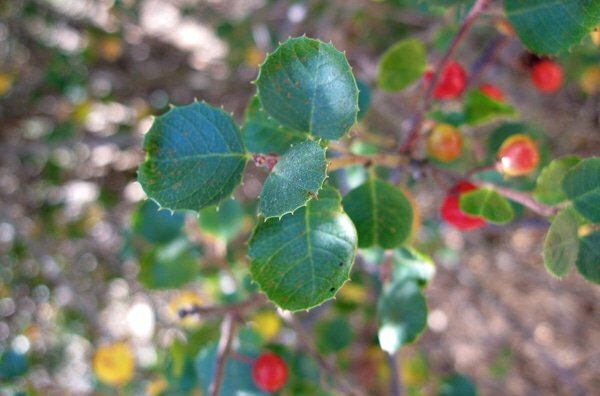 So I typed in “holly leaf red berry.” And found that the bush is actually called holyleaf redberry. Go figure. My next searches are always to add the terms “edible” and “toxic” to the plant. And here’s where things get weird. Both came up. What’s more, searches on what appeared to be the plant’s Latin name, Rhamnus ilicifolia, turned up precious little on either the edibility or the toxicity of this plant. Finally I found a reference to it being edible. I returned to the bush and picked a berry. I tasted it on the end of my tongue, as I do a lot with unknown berries. 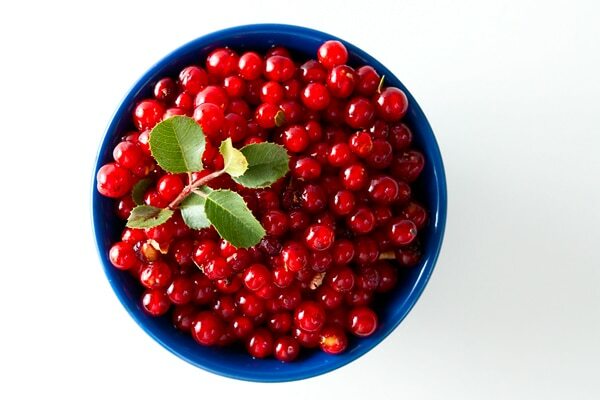 If the taste is bitter or unpleasant, the berry will either be unripe or downright toxic. You then spit everything out. This berry was soft, a little sticky and had two large seeds inside. I crushed it against the roof of my mouth and immediately got a hit of sweetness. A good sign. Then a hit of cherry, followed by an aftertaste like cinnamon. A very good sign. Still, I spit out the berry for safety’s sake. But I picked a little jar full to take home, just in case. Back to the research. One of the things any decent forager does when faced with a new plant is to check with the Indians. If the people who came here first — and were here for 10,000 years before we showed up — never used a plant, you can be pretty damn sure there’s something wrong with it. Thankfully there are several Native American ethnobotany databases online, including this excellent one from the University of Michigan. Oddly, a search of R. ilicifolia only turned up evidence that the Indians used the bark to help treat rheumatism. No word on the berries. Huh. Search after search, in places like the Jepson Manual, the USDA database and other places, turned up little or nothing on this plant. Now I started to get nervous. But I’d been doing the “sweet test” on berries with my tongue for 30-plus years and it had always worked. Could there possibly be a toxic berry that is also sweet? There had to be an explanation. More searching. Finally, I came across a piece of data noting that R. ilicifolia was not an actual genus-species name, like Homo sapiens. It was shorthand for Rhamnus crocea var. ilicifolia. So ilicifolia is a subspecies name! Off to another database, this one the Integrated Taxonomic Information System. This is where you go when you want to cut through a confusion of Latin names — and that happens more than you think. Everyone wants to name a new species of something, so you often get competing names for the same plant. The ITIS is the arbiter. And there it was: Not only was R. ilicifolia a subspecies name, it is an “unaccepted” name, too. Apparently the official subspecies name for this plant is R. crocea ssp. pilosa. There is a ton of data on Indians eating the berries of R. crocea. All these subspecies came about because the bush can have leaves of a different shape depending on where it is; the one on my walk happened to have holly-like leaves. Some have smoother leaves. But all the berries are edible, although some are better than others. Why did I bother to tell you all this? Because it is important to not mess around with new plants until you are 100 percent certain they are edible, and if so, how are they edible. Take the yew, for example. The flesh of yew berries is delicious, but the seed inside is highly toxic, and in large doses can even be fatal. I needed to know this sort of information with the hollyleaf redberry before I could experiment with it, and, more importantly, tell all of you about it. So what did I finally do with my redberries? I did what I do with any seedy berry: I made syrup. How I will use that syrup remains to be seen, but it is a powerful flavor. 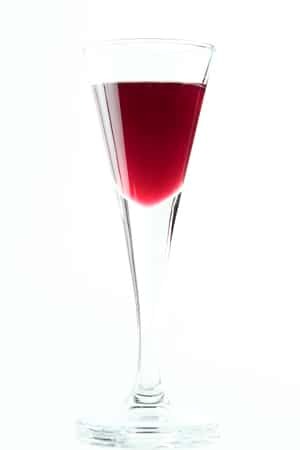 It’s as if cinnamon and a cherry had a love child, with a little bit of that funky aroma you get with a highbush cranberry. I suspect it will go really well in a pan sauce with wild duck. If you want to go get some yourself, you’ll have to be in Oregon, California or Arizona. The plant only lives there. If you don’t live in R. crocea’s range, use this post as a model for any new berry you may encounter: There are literally hundreds of edible berries in North America, and no one can know them all. 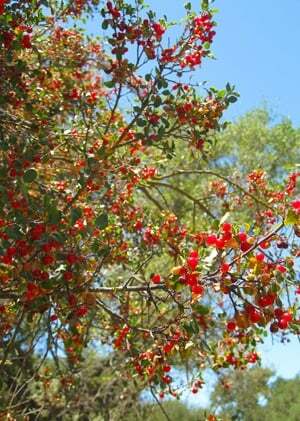 Hollyleaf redberries come ripe in July in California, and only stay on the bush a short time; the birds eat most of them. But if you can get a stash, make this syrup. Once made, the syrup can be used in cocktails, as a soda base, in ice creams, sorbets and granita, or as a fruity element in a pan sauce. Melt the sugar in the water in a small pot set over medium heat. Once the sugar has melted, add the berries and bring to a simmer. 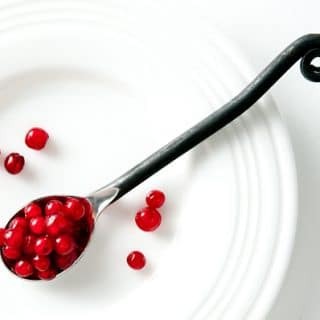 Turn off the heat, crush the berries with a potato masher and cover the pot. Let this steep off the heat for at least 1 hour, and preferably 4-6 hours. Set a food mill with the fine plate over a bowl. If you don't have a food mill, use a medium-meshed strainer set over a bowl. Pour the berry mixture through the strainer or food mill and sift out all the seeds. It's your choice whether to let the pulp get into your syrup. I like having some in there. Pour the finished syrup into a glass jar and keep refrigerated. We were at out cabin in Northern Arizona (specifcally, north of Ashfork at 5700 feet in juniper-pinion pine forest). What I called a holly bush had ripe blue colored berries. When cut open, they were blood red and sticky. Could this be a relative of the same bush you are describing? The berries were not in bunches like grapes, but on separate stems each.